Somehow over recent years ‘fintech’ came to mean more than the sum of its parts – financial technology (which is actually, contraction of its parts). ‘Fintech’ meant revolution while financial technology was just something everyone did. As we enter 2018 however, the two are coming back closer together. As Fintech reaches its tenth birthday it is no longer revolting, it is increasingly part of what every financial institution is doing – obviously with varying degrees of success. There are two questions then: what does fintech mean for financial services this year; and what will happen with ‘fintechs’ as a class? Industry analyst and fintech venture capitalist Grant Halverson, chief executive of McLean Roche Consulting and a former financial institution CEO, says fintech’s first decade has been “high on hype and spin but very low on delivering its ‘vision’ of a total disruption and decimation of Financial Services”. “There is no fintech equivalent of Facebook, Google, Skype or Apple,” he says. “That is not to say fintech companies won’t be successful and build current ideas into growth oriented start-ups which will be acquired through M&A”. Indeed it is increasingly likely to be the case: fintechs will become part of the establishment. No longer the devil but in the words of Mel Smith’s liberal priest in Not the Nine O’Clock News: more along the line of “Christians should have a bit less of the ‘get-thee-behind-me Satan’” and more “come in me old mate and have a cuppa tea”. History tells us while new technologies often destroy companies – Kodak and the digital camera being the most quoted example – they far less often destroy industries. For every automobile rendering the horse a hobby, there’re dozens of examples of sectors absorbing the disruptors. Take peer-to-peer lending - the highest-profile fintech sector which promised to bring borrowers and lenders together and cut out the banks. “Launched when money was cheap, the sector has realised it is not quite that easy to build a billion-dollar business,” Halverson says. “Incumbent banks are protected by considerable regulation, have vast resources and will not fall over easily, this is not the taxi industry. 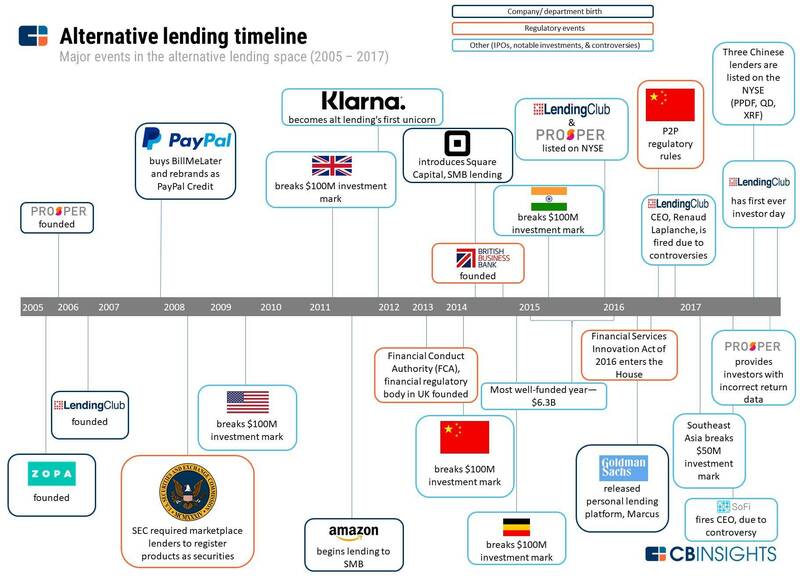 CB Insights’ latest analysis of alternative lending highlights the slow grind even this most promising disruptive sector faced. Moreover, in its outlook CB Insights foresees a history which at least echoes what we have seen many times before: rationalisation as players fail; consolidation as the bigger consume the smaller; unbundling as different players – including traditional incumbents – adopt technologies and practices. Fintechs face particular challenges. For start-ups, the key challenge is scale and customer acquisition. For bigtech, like Amazon or FaceBook, the challenge is trust. Banks may not be liked but they are trusted to preserve people’s money and personal data. For fintechs of all size, regulators and governments are likely to err on the side of lower risk, shielding incumbents. As BankMobile founder Luvleen Sidhu told the Wharton Business School’s Knowledge@Wharton, slower adoption of radical banking in US “is partly because of the regulatory environment”. Halverson’s take is the fintech world, despite being such a hot sector, actually hasn’t attracted enough money to make a difference and the outlook is not conducive to much greater investment. “Competition and increasing interest rates will challenge the valuations which are currently 50-60 per cent higher than other investment categories and will require faster delivery and increased performance,” he says. Halverson argues the “modest” level of investment to date at $US53.9Billion is not enough to create the next financial giant. He points to Facebook, founded in 2004 with an initial $US500,000 investment by Peter Thiel, which then had 11 funding rounds with $US2.3 billion invested prior to its 2012 IPO. But it would be wrong – and this is certainly not Halverson’s argument – to say fintech innovation is not going to radically change financial services. It will – from inside more than outside. The way traditional banks in Australia responded to (and eventually bought) the main non-bank mortgage originators which overturned home lending in the 90s. Or indeed how Apple has grown by acquiring the technologies we now assume to be Apple innovations via companies like Beats Electronics, Turi, Quattro Wireless or Anobit. Gartner’s famous Hype Cycle for emerging technologies is no less applicable for fintech. The curve starts precipitously upwards with an Innovation Trigger before peaking acutely at the limit of Inflated Expectations. There follows an equally precipitous Trough of Disillusionment before those technologies and companies which have survived start to more slowly climb the Slope of Enlightenment before the distant Plateau of Productivity. Fintechs are strung out all along this curve. Some are approaching productivity where they will genuinely change the system but many are plunging down to the trough. Others are rapidly climbing to the hype summit – think cybercurrencies, blockchain, artificial intelligence, machine learning. Now there’s no doubt these developments will fundamentally alter financial services. Respected fintech commentator Chris Skinner, in one of the thousands of New-Year prognostications but one of the few worthwhile ones, put AI at the top of his list of world changers for 2018. He also identified open banking and the ongoing challenges of digitalisation. Getting to grips with fragmented data was another tip from Skinner – “rationalising and cleansing core data structures” – and of course blockchain. These themes are captured nicely in an infographic by Customer XPS. What Skinner is yet to see is the “automobile” which is going to render the old nags of banking obsolete. The other nuance is the distinction between fintech innovation and fintechs. More and more we are seeing fintech start-ups being absorbed into the system, sometimes, like in Japan, almost by decree. What then will distinguish the winners and losers in financial innovation is not the single idea or technology, it will be the ability to assimilate – either incumbents bringing fintechs into the fold or fintechs learning how to work with and best exploit the incuments.